Connect Skynamo Sales App to Acumatica to get Finance and Sales working together to increase your cashflow. 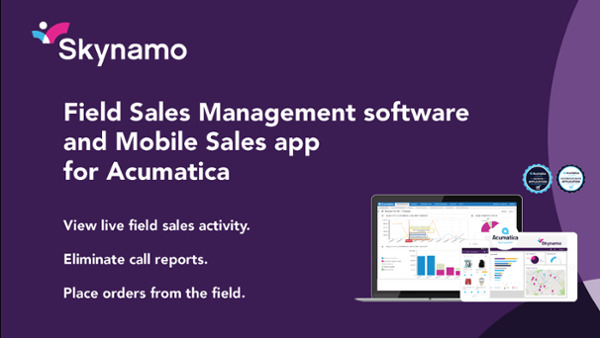 Skynamo is a mobile-first sales app and Field Sales Management software for Acumatica that seamlessly connects sales to finance, so your sales and finance teams view the same data all the time – even while sales reps are on the road. Plus, offline functionality means sales reps can continue working even if offline and data gets synchronised as soon as they come back online. Contact us for a fantastic demo and engaging discussion on how Acumatica and Skynamo can - together - increase your cashflow.